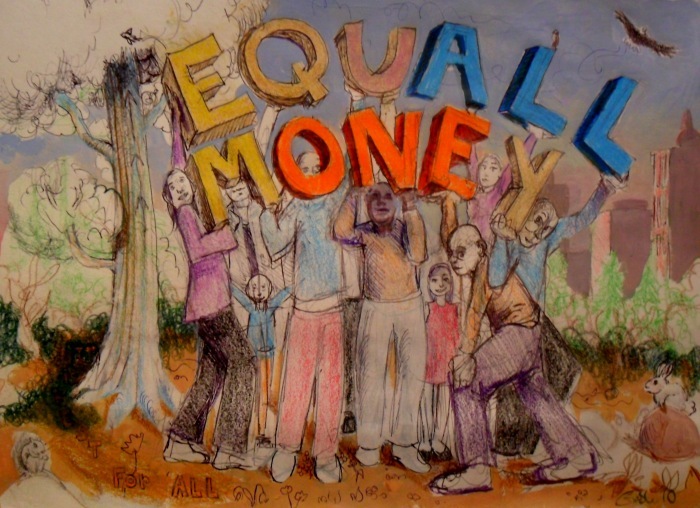 I forgive myself that I have accepted and allowed myself to not realize that WITHIN a System Controlled By Money, the Message of Equality and Equal Money Must be Supported By Money ‘till it Manifest as a Way of Life. Agreeing with Equal Money and Not Supporting it Financially is Demonstrating a Lack of Common Sense and is Counter-Productive, Because the Supporter of Equal Money WILL Support the Abusive System with Money, but not the Solution, which indicate an Astounding Level of Ignorance and Stupidity. I forgive myself that I have accepted and allowed myself to not realize that in a System Where all Information is Moved by Systems that Cost Money and by People that Requires Money to be able to Present a Message, the Message Cannot be FREE, as the Very IDEA that Messages of FREEDOM and Solutions to the World System to be FREE - is the Way the System Brainwash Activists into Self Sabotage to Be Completely Ineffective in Every Way, Causing Division based on Ignorance, Showing that the Activist is NOT a TRUE Activist, but actually a Supporter of the Systems of ABUSE. Thus, People that Study the Desteni Message and Equal Money Solution, and do not Regularly Contribute financially are Actually only Causing Harm and are Self Dishonest and Lack any form of Reason and Common Sense. I forgive myself that I have accepted and allowed myself to not realize that it Will take Many Years with Many People standing together financially and with Writing and Support of the Message to Change the World, and that Each One Must Investigate How They Spend their Money to Understand Why the World is Not Changing, as Money is In fact the Direction of One’s Choice and Integrity that Indicate Who You Really are and Whether What You Do will Make Any Difference. Indifference is SHOWN in HOW you Spend your Money. The only Way to STOP a World of Abuse, is a New System that Provide for All Equally and that Can Only Come into Being through financial Support Regularly; just like Contributions to Religion Made Religion Some of the Strongest and biggest Organizations that Keep Control through How they Spend and Control Money, to Make Sure that the World DO NOT change. If you are an Activist that DO NOT Support the Solution financially, You are Part of the Problem, and Should investigate Yourself in Self Honesty and Study the Journey to Life to Gain some Integrity. I forgive myself that I have accepted and allowed myself to not realize that the Intent of ABUSERS of the Desteni Message and the Equal Money Message, focus on Preventing People to financially Support Desteni and Equal Money, because they KNOW that is HOW to Stop Any Change in the World. If you are Foolish Enough to be Swayed by Such Abuse to Not Support the Solution Financially, you are Part of the Problem, because you can be Controlled by Fear and Lies, and should not Claim that you Support any Solution in this World, as You are UNABLE to Understand the Way the World Functions in fact. I commit myself to SHOW that Fear is the Best Weapon Used by those that Do Not want the World to Change. I commit myself to SHOW that those that Want Support for FREE, are Parasites of Ignorance Produced by the System to Make Sure ABUSE and Profit DO NOT STOP. Call Out the Abusers, and Make Sure you Do Not Value Support that Do Not Include the Practical Action which is Financial Support, as Money is Critical to Produce the Support, which Any Person with Common Sense Reason and a Free Mind, will Realize. I commit myself to SHOW that Abusers of FREEDOM will use The IDEA of FREE Products to Stop change, by stimulating the Brainwashing of Religion and Consumerism to Pretend that these Systems GIVE FREELY, while these Systems Can Only Give because they have Money and Regular Financial Contributors. Be Part of a Practical COMMON SENSE Solution that is Best FOR ALL LIFE through the FINANCIAL ACTIONS you TAKE. TAKE ACTION! BE the Actual ANSWER! BE AWARE of System Parasites Disguised as Activists. They will DO NOTHING REAL that will focus on the Cause of the Mess on Earth to Bring Lasting Change, and they will TALK but NOT PARTICIPATE in a GROUP to Ensure World Change.